Over the last few decades, outsourcing has been widely accepted as the key project management strategy for the efficient utilization of the organizations' resources. EdCIL has successfully provided Logistics Support for national level implementation of prestigious social sector projects of Government of India and International Funding Agencies. For each of these projects, EdCIL has performed as a strategic partner consultancy organisation providing core competence in the specified areas. Organizing Seminars, Workshops, Study Tours, Field Visits, Fellowship Programmes, etc. Preparation of Research & Evaluation Reports. "Rashtriya Madhyamik Shiksha Abhiyan (RMSA)" was contemplated by Ministry of Human Resource Development to achieve Universalization of Secondary Education, which has already been achieved by in a large number of developed countries and several developing countries. Technical Support Group (TSG), EdCIL is entrusted to give support to implement the scheme. The vision of the scheme is to make good quality of secondary education available, accessible & affordable to all young persons in the age group 15-16 years. Universal access to secondary level education by 2017, i.e., by the end of Twelfth Five Year Plan. The scheme was launched by the Department of School Education & Literacy, Ministry of Human Resource Development (MHRD) in 2008-09 with the objective to establish an enabling environment to reduce the drop outs and promote the enrolment of girl children mainly belonging to SC/ST communities in secondary schools and ensure their retention up to secondary stage. The scheme is covered under the Direct Benefit Transfer (DBT) scheme launched by the Government of India. According to the scheme, a sum of Rs.3,000/- is deposited in the name of eligible unmarried girls as fixed deposit on enrolment in class IX, who are entitled to withdraw it along with interest thereon on passing X Class and attaining 18 years of age. The scheme covers (i) all girls belonging to SC/ST communities who pass class VIII and (ii) all girls who pass VIII examination from Kasturba Gandhi Balika Vidyalayas (irrespective of whether they belong to SC/ST) and enroll in class IX in a State Government, Government-aided and Local Body schools. 100% funds are provided by the Central Government for the Scheme. The National Programme of Nutritional Support to Primary Education (NSPE), popularly known as the Mid-Day Meal Scheme, is one of the major initiatives of Ministry of Human Resource Development, Government of India to achieve Universalization of Elementary Education in the country. With the extension of Mid-Day Meal Programme to Upper Primary Stage, Mid-Day Meal Programme is now one of the flagship Programmes of Govt. of India. This Programme, therefore, requires close monitoring and evaluation through internal and external monitoring, supervision, guidance, and integration of various activities at all levels based on the advise of experts in the area of Planning, Monitoring, Supervision, Evaluation, Impact Studies, Documentation, Nutrition, Inclusive Education for Children, Media etc. A Technical Support Group to support the Scheme has been established under the aegis of Ministry of Human Resource Development (MHRD) by EdCIL (India) Limited to perform these vital tasks. India has a large number of teachers and needs many more. All processes of teacher recruitment, training, motivation, incentives, retention and feedback therefore have to be planned on a large scale. Further the ultimate goal of in-service teacher development should be to ensure that optimal learning takes place in the classrooms. To enhance the institutional capacity available at present for ensuring the adequate supply of trained teachers for all levels of school education. To recognize teacher education (for all levels of school education, from pre-school to senior secondary) as a sector of higher education and to facilitate co-operation and collaboration between institutes of teacher training and colleges of general education or universities with a view to enabling interaction between different departments of a local college (or university) (e.g. sciences,languages, social sciences) and the institute of teacher training. To envision a comprehensive model of teacher education, utilizing the Chattopadhayay Commission Report and updating its perspective, and ensuring that progress towards a new,comprehensive model is paralleled by necessary modifications in policies of teacher recruitment, deployment and service conditions, including emoluments. "Saakshar Bharat" was formally launched by Prime Minister, Dr. Manmohan Singh on 8th September, 2009. The programme aims to further promote and strengthen Adult Education, especially of women, by extending educational options to those adults who having lost the opportunity access to formal education and crossed the standard age for receiving such education,who now feel a need for learning. The Mission has four broad objectives, namely, Impart functional literacy and numeracy to non-literate and non-numerate adults, Enable the neo-literate adults to continue their learning beyond basic literacy and acquire equivalency to formal educational system, Impart non and neo-literates relevant skill development programmes to improve their earning and living conditions, Promote a learning society by providing opportunities to neo-literate adults to continue their education. The Government has set a National Goal of achieving by 2017, 80 percent literacy rate and reducing gender gap in literacy to 10 percent. In addition, minimizing regional, social and gender disparities with Special Focus on Scheduled Castes, Scheduled Tribes, Minorities, disadvantaged groups, adolescents and low literacy States and tribal areas is the other national target. 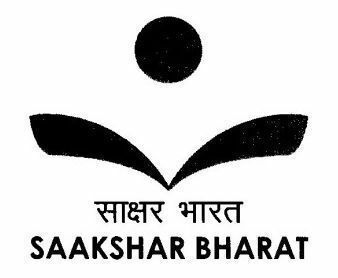 National Literacy Mission Authority (NLMA) is the operating and implementing organization for Saakshar Bharat at national level. A Technical Support Group to support the Scheme has been established under the aegis of National Literacy Mission Authority (NLMA) by EdCIL (India) Limited to perform these vital tasks. National Project Implementation Unit (NPIU) was established by EdCIL in 1990 and is since being maintained for providing technical support exclusively for implementation of World Bank Aided Technician Project I, II and III for improving the quality of technical education in the country. In addition, EdCIL was assigned the task of providing technical support for implementing Technical Education Quality Improvement Programme (TEQIP) of the Government of India with World Bank funding of Rs.1550 Crores, towards upgrading the quality of technical education in the country. National Mission on Education through Information and Communication Technology (NMEICT) is envisaged as a Centrally Sponsored Scheme to leverage the potential of ICT (Information and Communication Technology) in providing high quality personalized and interactive knowledge modules over the internet/intranet for all the learners in higher education institutions in any time anywhere mode. The mission has two major components viz. Connectivity along with provision for access devices for institutions and learners. The Government has accorded high priority to the development of education sector and for this purpose a number of flagship programmes are being implemented to build the infrastructure. However, in the absence of an effective institutional mechanism, the statistics reflecting the outcomes of these initiatives of the Government become available only after a considerable time lag and with a number of limitations. To prepare a sound data-base on Higher Education, Ministry launched All India Survey on Higher Education (AISHE) to collect data from all the institutions of higher learning in the country through electronic mode. Keeping in view the need for generating reliable data on regular basis, the Ministry further decided to continue the survey on an annual basis and for which creation of a scheme was needed. The XII Plan categorically highlighted the need for a strong current and comprehensive data for evidence-based policy making and effective planning. The Plan document also took note of the All India Survey on Higher Education initiated by the Ministry of Human Resource Development and indicated that it can provide useful insights and can be the first step towards creating a comprehensive higher education data management system. Keeping this in view, a new plan scheme Higher Education Statistics & Public Information System (HESPIS) was proposed in XII Five Year Plan. The meeting of the Standing Finance Committee (SFC) was held on 05.12.2013 under the chairmanship of Secretary (Higher Education) in which the scheme was approved. The total cost of the scheme is Rs. 99 crores for the duration 2012-17. Periodically reviewing all regular surveys by undertaking in-house reviews of actual results over time and identifying data-gaps. Strengthening Institutional Coordination between Ministry and other data producing agencies such as University Grants Commission, All India Council for Technical Education, National University of Educational Planning & Administration, Medical Council of India, State Government Departments, Examination Boards etc. HESPIS is an umbrella scheme catering to the need of various kinds of Statistics related to higher education sector. Steering Committee will be constituted under the chairmanship of Secretary (higher Education) with the representation of heads of various stakeholders from all the sectors including Planning Commission, UGC, AICTE, NUEPA etc. to address various issues relating to higher education statistics. Technical decisions related to Higher Education Statistics will be taken by Steering Committee. Setting up of AISHE Unit in the State and AISHE cell in each Affiliating University to coordinate All India Survey on Higher Education. States and Institutions to ensure uploading of data and its authenticity for receiving funds. Funds would flow from the Ministry of Human Resource Development (MHRD) to the Higher Education Institutions, through the AISHE State Unit/ AISHE University Cell. AISHE State Unit will be the key institution at the state level to channelize resources to the institutions. State wise allocations would be decided on the basis number of Higher Education Institutions located in the State. Remuneration to the Institutions would be based on the workload per Institution. Pandit Madan Mohan Malaviya National Mission on Teachers and Teaching scheme is launched in December 2014 and came into effect in March 2015. The Mission is mandated to ensure coordinated approach to holistically deal with shortcomings at various levels of teachers and teaching. The Mission focuses on the whole sector of education without fragmenting existing programs based on levels and areas such as school, higher and technical. It is an umbrella project which will craft synergy among various ongoing initiatives on teachers and teaching under the MHRD. It provides an integrated platform for integrated teacher/faculty related program and schemes and create vertical and lateral linkages. The program envisages augmenting capacity at individual level and also enhance institutional infrastructure to give impetus to training of teachers at pre-service and in-service level. The broad objectives of the Mission are to address all issues related with teachers, teaching, preparation of teaching, professional development, curriculum design, designing and developing assessment and evaluation methodology, and research and effective pedagogy development.